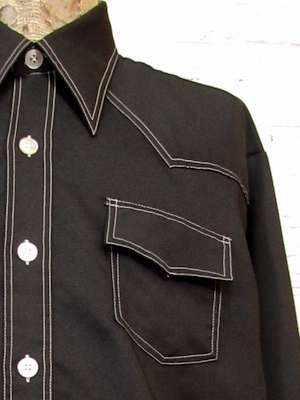 Home > Vintage Western Shirts > All Vintage Western Shirts > (roomy XL) Mens 1970's Western Style Polyester DISCO Shirt! Black with White Top Stitching. 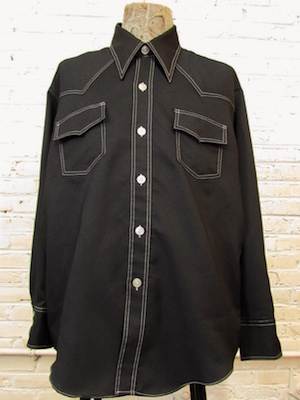 Mens Vintage 1970's Western Style DISCO Shirt! Black polyester with bright white top stitching!Top stitching outlines the yolk, pockets, collar placket and cuffs. Great for the Urban Cowboy look! Pearly white plastic buttons down the front with three matching buttons on each cuff. Patch pocket on each chest. Tapered hem with Long, Pointy Disco collar. Tagged by Gaucho Originals. No Material tag, but feels like Polyester. Made in USA. Condition: Very Good: Has some loose threads in the Placket, visible in Photos. Still an AMAZING Shirt!